I firmly believe that The Mentalist is playing fair. 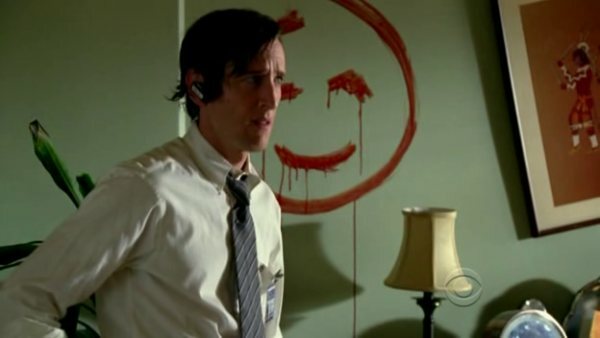 By that I mean that Bruno Heller specifically, and all the producers of The Mentalist, have had a firm idea of where the Red John storyline was going right from the start of the show. I'm not suggesting that some 'master list' of the series' plot-intensive episodes exists, or that the producers had any idea what the specific clues or twists in the Red John storyline were going to be more than a few episodes in advance. I do, however, believe that those producers have known who Red John was all along, and have been careful, even as their plots and characters evolved, never to give any information or clues that contradicted anything already established as fact. Beyond that, I believe that the mystery as presented by the show has been solvable, and what's more, I believe that I have solved it. It's all in the letter he leaves Patrick - the family gets murdered because he feels Patrick lied about him. So if that pride is his defining characteristic, what kind of behavior should we expect from the character, and how might we use that to guess the killer's identity? His face overlaps the symbol in nearly every shot. 1 - We know the Red John has an unusually high amount of access to the inner workings of the CBI. The most logical explanation for this is that he works there. 2 - Red John never leaves evidence of any kind at crime scenes. Someone whose day job is knowing every detail of how crime scenes are investigated would obviously be unusually capable of making sure that he left no evidence himself. 3 - Given Red John's well-established pridefulness - it's there in the pilot and is reinforced time and again; the fate of Christina Frye, the murder of William Panzer - doesn't it make sense that he wouldn't be able to resist investigating Red John copycats himself? He makes sure that he's assigned both times it happens, and then he follows the case very closely while he's there. How was he able to swoop in and rescue Patrick in the season 2 finale? 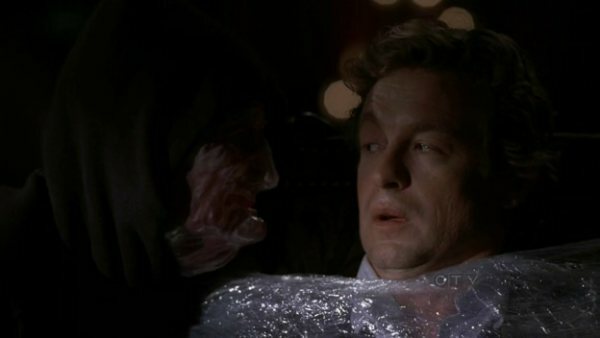 Simple - Red John had been following Patrick the entire time, since he knows that Patrick is the only person with as much passion for uncovering imposter Red Johns as him. He only intervened when it was clear that Patrick had screwed up, and was going to be killed by the imposters. From a build/voice standpoint it certainly could be Jack Plotnick, but there's no way to tell for sure. It could be an unbilled actor put in the outfit as a misdirect, or it could be I'm completely wrong and they cast a random actor in the part because they hadn't decided who would be playing Red John yet. So after hitting on this idea, I continued watching the show, curious to see if any clues would be revealed that gave credence to or refuted my theory. I found one relatively quickly, although to explain it, I have to go into the rules of television production. Specifically, about how television characters are named. Avoiding confusion is so vitally important when making a show that you flat-out won't ever see characters with the same name anywhere near one another. While there may be three different one-shot characters named 'Sam' over a few seasons of The Mentalist, you can be damn sure those Sams will be spaced out, and you can be even more certain that there won't ever be a one-shot character named Patrick, or Grace, or Kimball. That's a fairly definite rule of fiction, and it's only broken when someone is trying to make a point. Take, for example, the Gilmore Girls. On that show mother and daughter were both named Lorelei - this creates the possibility for confusion, but in this case it's an important aspect of the elder Lorelei's psychology: she named her daughter out of a narcissistic desire to recreate herself, and give the new version of her the childhood/mother she'd dreamed of, rather than the one she had. This over-identification with her child underlines all of their interactions throughout the show, heightening the drama. Confusion with a point. 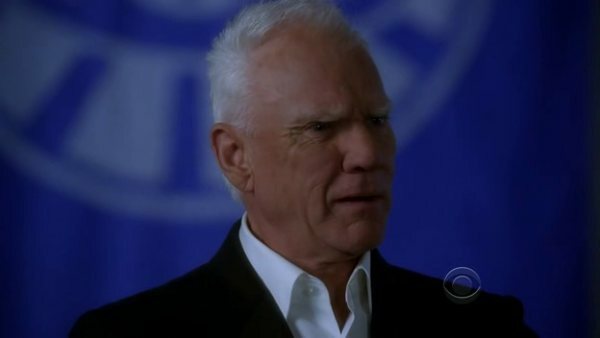 This is Malcolm McDowell, who plays the leader of the scientology-inspired cult 'Visualize' on the show. His character's name? Bret Stiles. So right there, you've got what seems to be a violation of one of television production's cardinal rules. It's not like Bret Stiles was ever intended to be a one-shot character. When first introduced, McDowell is established as a formidable threat, and he ends the episode completely free, despite having been implicated in the planting of a bomb. 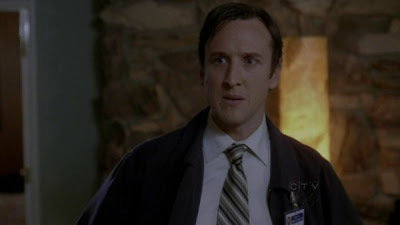 He's presented as a character who will definitely be reappearing, especially since in his first scene with Patrick, he brings up Red John apropos of nothing in order to put Patrick off balance. This double-naming can't have been an accident, either - Bret Stiles first appears in episode 220, and Brett Partridge's second appearance was just three episodes later in the season finale. That means the two scripts were being broken and written contemporaneously, and that there would have been time to fix the mistake if it had been one. Either by changing McDowell's character name by filming time, or Plotnick's character name in the later script - which would have been even easier, since it's not like it had ever been said on the show. I'm convinced that there's some significance to both characters sharing a name, and I feel it's proven by the odd spelling of McDowell's character's name. 'Bret' with a single T. Why spell it that way? It can't be to avoid confusion for the audience, since hearing those two characters' names aloud will be indistinguishable. The only possible reason is so that people looking at the scripts won't be confused - a move that acknowledges that both of these characters are going to be showing up in subsequent scripts, and are likely important. 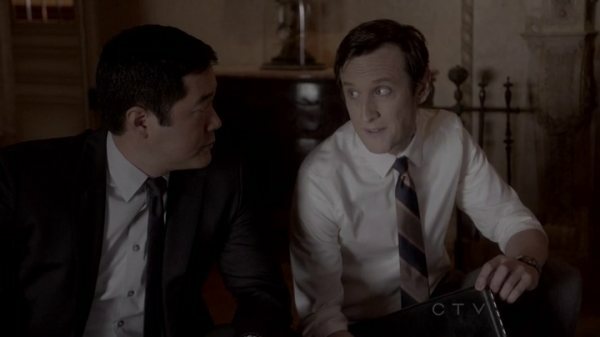 So, what's their connection, and how does it suggest that Brett (with two Ts) is Red John? Bret is the first to offer a clue - not only does he bring up Red John in his first episode, but in his next appearance (episode 303) he's able to offer a secret of Red John's, the location of the brainwashed Christina Frye. How does he have this information? Stiles refuses to say, but there are two possibilities - one is incredibly obvious: He is Red John. I've dismissed this one out of hand. The second possibility is only hinted at in the episode: each week every member of Visualize updates a video diary listing every bad thing they've done. What if one of Red John's 'friends' is also a devout member of Visualize? In the same episode it's revealed that a member of the FBI has infiltrated Visualize, and Stiles allows him to remain there undercover, solely so that he can feed the government information he chooses at a time he prefers. Isn't it just as likely that he could know about Red John's people in his own group and allow them to continue their work because of the insight it gives him into the workings of a competing (or possibly affiliated) organization? After episode 303, Bret Stiles is absent from the show for more than a year, and it isn't until season five that a concrete connection is finally established between Red John and Visualize. 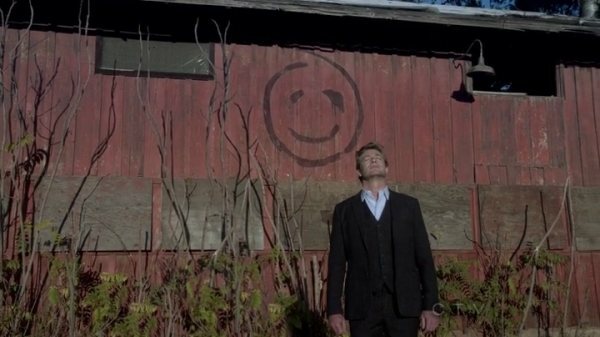 In episode 513 "The Red Barn", Patrick and the team investigate a multiple murder committed 25 years earlier at a farm owned by Visualize, and discover that the murders may well have been Red John's first kills. 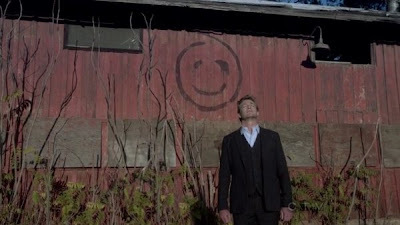 The key element driving them to this conclusion is the earliest confirmed appearance of Red John's version of the 'smiley face' logo, painted on the side of the barn. Kyle Secor, playing a priest and former member of Visualize who ran the farm, claims that he was told that a young man who worked at the farm painted the symbol. This establishes Red John as a young member of Visualize in the 80s - putting his current age anywhere from mid-40s to early 50s. There's no reason to call this testimony into question, since the Kyle Secor character has no reason to lie, unless he's also involved in the Red John organization. Which seems a little too random to be a satisfying solution. Especially since just five episodes earlier, the show made another heavy implication of a connection between Red John and Visualize without ever coming out and saying it. Episode 508's big revelation was that Red John and Patrick have shaken hands at some point in the past, which confirms that Red John is someone in Patrick's life. A great clue to be sure, but there's another one in the episode. When Lorelei is discussing her sister's death, and how Red John guided her through it, she talks about facing her greatest fear and becoming fully aware afterwards. 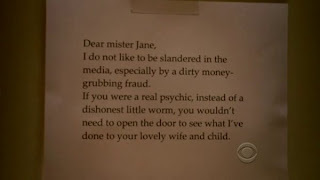 These lines are presented as things Red John has convinced her, and while the specific words are different, they're thematically identical to the Visualize dogma that Bret Stiles spouts. Red John has built his own cult based partially on the philosophies that Bret Stiles spouts - so when he got around to building a false identity for himself to use as his day-to-day persona, doesn't it make sense that he might name himself after his inspiration? That's not to say that there aren't other possible suspects for Red John. Reed Diamond and Robert Picardo both play men of the correct age with connections to Visualize and Patrick, the head of the CBI has volunteered a fondness for the poetry of William Blake, from whose cannon Red John quoted at a key moment. Any one of these people could be Red John, and there are more suspects besides, but based on the clues as presented, I remain sure of my prediction. It's possible that having a theory this long has left me unable to see any other clues, and when, in just over a week, massive revelations abound in the season-ender, and it turns out I've been wrong all along, and Red John is someone completely different that makes perfect sense, I promise to be appropriately chagrined. Just working a regular case, with nary a mention of Red John anywhere. He was just dropped randomly into the episode for no particular reason, as if the producers wanted to remind viewers that he existed. And according to CBS' press release for the finale, he's going to be in that episode as well. Did I call this three years ago, or was I completely fooled by a really well-constructed Red Herring, and I've just spent hours of thought searching for the flimsiest justification for the theory? I honestly don't know, but I'm super-excited to find out! And now, I leave you with the one time in the entire show that a non-disguised portion of Red John appeared onscreen. Try as I might, I've never been able to glean the slightest bit of information from this screenshot. Thank you. You've given me a little peace at last. I just don't have time to analyze the show as you have done (and I wonder if I would be able to do as good a job), I am starting to get fed up with Red John, and you have provided a very well reasoned and (what's even rarer these days), a well-written piece on it. I can now relax temporarily with some idea of who the culprit is, until the show's administration decides to favor us with a resolution. Honestly, do we have to drag it out this long? I'm all in favor of a Napolean of crime in the show, although it seems like every show that aspires to be memorable has something similar now. But couldn't they give us a crumb of satisfaction now and then, as "Castle" does? This is a different time and place than Victorian England. Even Doyle didn't drag it on incessantly, and he's the template. He threw Moriarty in once in a while to spice things up, but allowed us to forget about him most of the time while Holmes and Watson continued to astound us unabated by constant failure to bring Moriarty to ground. 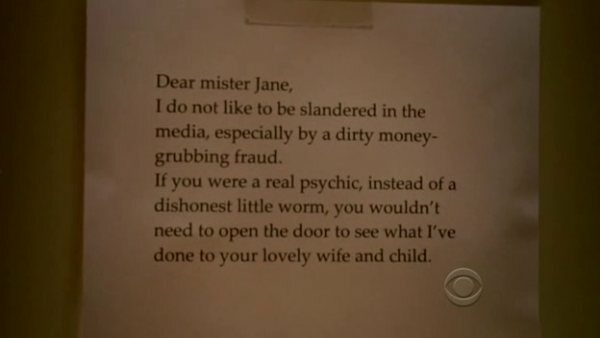 Jane's supposed brilliance, the main reason I watch the show when I can, is fraying at the edges.